In Egypt, Google Exec 'Galvanized' Protesters : The Two-Way Wael Ghonim's emotional appearance on TV after spending 12 days in custody has given the movement added momentum. Today's anti-government turnout was among the largest since demonstrations began. 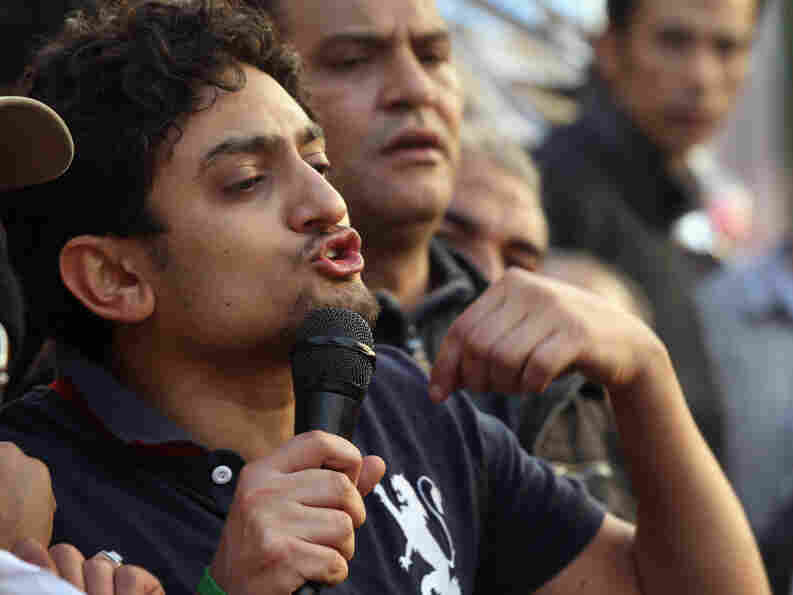 Wael Ghonim greeted thousands of anti-government protesters in Tahrir Square earlier today (Feb. 8, 2011). Reporters in Cairo say the number of protesters in Tahrir Square today is noticeably larger than in the past few days and that the anti-government turnout is among the biggest in the 15 days since the demonstrations began. An Al-Jazeera correspondent says "that crowds are pouring in from all sides." ABC News' Terry Moran posted on his Twitter page that there's a: "Huge crowd in Cairo. All ages, backgrounds, men and women, Muslim, Christian, tattooed secular. 'We are Egypt,' they chant. Breathtaking." CNN's Frederik Pleitgen tweets that: "Many more people in Tahrir Sq today then the past couple of days. People tell us they are still going strong." NPR's Lourdes Garcia-Navarro reports from the scene that one reason for the larger turnout today is that many protesters were "galvanized" by Google executive Wael Ghonim and what he had to say yesterday on TV after being released by Egyptian authorities — who had held him for 12 days. Ghonim helped organized a Facebook campaign that is at least partly responsible for igniting the protests against President Hosni Mubarak's government. "We are beautiful people," Ghonim said, according to a translation done by columnist Sultan Sooud al Qassemi of Abu Dhabi's The National. "We have to restore dignity to all Egyptians. We have to end corruption. No more theft. Egyptians are good people." As Eyder wrote yesterday, Ghonim also cried while being interviewed on TV and said "I want to tell families who lost their sons this is not our fault. This is the fault of those clinging to power." English captions have been added to other sections of the interview as well and posted here. Ghonim posted word this morning that he was headed to Tahrir Square and there's word from there that he's speaking to the crowd. Update at 1:05 p.m. ET: NPR's JJ Sutherland reports from Cairo that the crowd is so large, it's spilling into other parts of the city. It may be the biggest demonstration yet since the protests began. — "I'm not a hero, but those who were martyred are the heroes." Update at 10:30 a.m. ET: Foreign Policy magazine says that "by kidnapping, detaining, and then releasing Ghonim — instantly turning him into a nationwide celebrity — the regime may have just created an undisputed leader for a movement that in recent days has struggled to find its footing, seemingly outfoxed by a government skilled in the dark arts of quashing and marginalizing dissent."